This low-cost mini USB CH341A 24 25 Series EEPROM Flash BIOS USB Programmer is intended to support 24xx Series EEPROM and 25xx series SPI flash 8pin/16 pin chip. It is equipped with CH 341A chip, can automatically recognize 25 series chip, and its 24/25 series indicator lamp enables the user to easily recognize module’s working status. 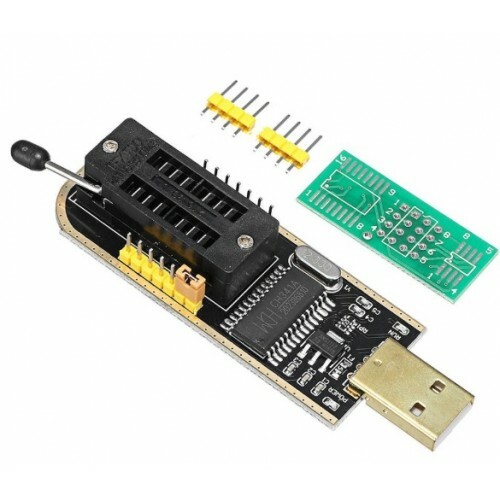 This awesome programmer is also user-friendly because it supports USB to TTL conversion and the SOP8 SOP16 to DIP8 converter board makes the connection with different chips easily. CH341 is a USB bus convert chip, providing UART, printer port, parallel and synchronous serial with 2-wire or 4-wire through USB bus. In UART mode, CH341 provides alternant rate control signals such as serial transfer enable, serial receive in ready etc. It also supplies common MODEM communication signal in order to expand UART for computer or upgrade common synchronous interface device to USB bus directly.